An Anglo-Saxon building has been discovered on our land at the Sylva Wood Centre. The large house or hall was excavated in autumn 2016 by a team comprising local people, volunteers trained in archaeological techniques through a now completed HLF project in East Oxford, and archaeology students from Oxford University Department for Continuing Education (OUDCE). The team was led by University of Oxford archaeologists from the School of Archaeology and OUDCE. Archaeological excavations at Sylva Wood Centre September 2016. Photo Adam McBride. It seems that the village of Long Wittenham lay within the heartland of the early kingdom of the Gewisse, later known as the West Saxons. 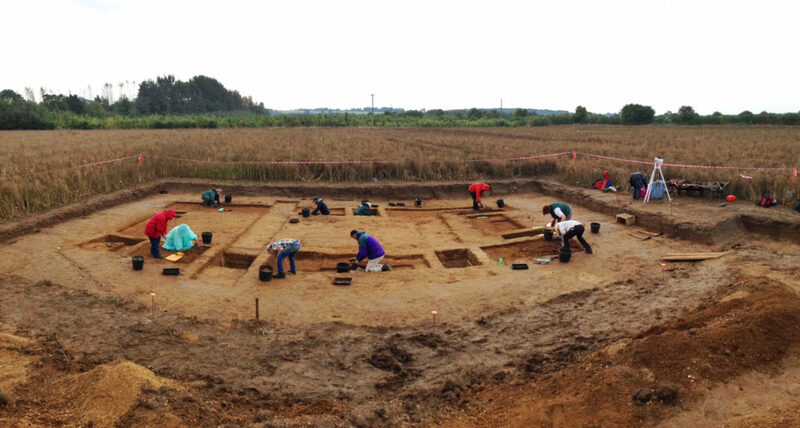 The area has produced evidence of a wide range of early medieval activity, of which the recently-excavated Anglo-Saxon building forms an important part. Two early Anglo-Saxon cemeteries containing richly furnished weapon burials indicative of links with mainland Europe, and an adjacent complex of large, high-status buildings visible in aerial photographs, lie just a few hundred metres from our building. The excavated building is likely to date to the seventh century, a period that saw rapid social change in England including the emergence of the first English kings and the conversion to Christianity. Timber remained the building material of choice for Anglo-Saxon kings and nobility, even several centuries after stone construction was reintroduced for building churches. Indeed, the word ‘timber’ is an Anglo-Saxon one and was synonymous with the act of building itself. Oxford TV visited this week and interviewed Jane Harrison from University of Oxford Department for Continuing Education, DPhil student Adam McBride, and volunteers – watch the clip below. I feel I must add though that in one way trees can preserve archaeological features, not destroy them. Look at the hundreds of acres of field systems below ‘ancient’ woods recently discovered by LiDar in West Sussex from the initiative of the South Downs National Park.